The IEP emphasizes the establishment and development of a system of rules for European governance (structure, institutions and EU treaty reforms). 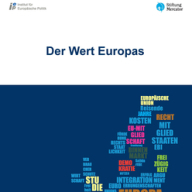 Current reform debates, especially those regarding treaty reforms and long-term trends of European Integration, are analysed and evaluated by interdisciplinary means and from many different perspectives. Euroscepticism, democratic deficit and low electoral turnout are affecting all EU countries. Across the EU, we are witnessing extensive protests or forms of active citizenship, ranging from pro rule of law protests in Romania and Bulgaria, recent anti-populism and pro EU in Germany or anti-austerity movements in Greece. In this context, how can we use most of these civic manifestations to debate the future of the EU? These movements require special attention for a proper understanding of the values their supporters stand for.